This week in “Better Know a Scientist”, I’m interviewing Estefania Elorriaga. She’s in the midst of her PhD in Dr Steven Strauss’ lab in the Department of Forest Ecosystems and Society at Oregon State University. She is doing research on using site-specific nucleases for mutagenesis (fear not! She’ll have to explain her research in this interview). Let’s get started! Q: What are site-specific nucleases? Why are they important? Site-specific nucleases are enzymes that can cut DNA at specific locations in the genome of your organism. The nucleases create a break which stimulates the organism’s DNA repair mechanisms to fix the break. Occasionally, the repair mechanisms will make a mistake (delete some DNA or insert some extra DNA) that will lead to a loss-of-function mutation in the target gene, meaning that the protein you targeted will no longer do its job. Examples of site-specific nucleases are zinc finger nucleases (ZFNs), transcription activator-like effector nucleases (TALENs), the CRISPR (clustered regularly interspaced short palindromic repeats)-Cas system, and engineered meganucleases. Site-specific nucleases can also be used for gene repair or gene replacement with the addition of a donor DNA sequence. These technologies are important because they allow scientists to modify only specific locations of genes in order to obtain a desired trait. In the area of crop breeding we believe these technologies will be crucial for improving current lines specially for particular cases like drought-tolerance, high or low temperature tolerance, disease resistance, or even nutrient content. 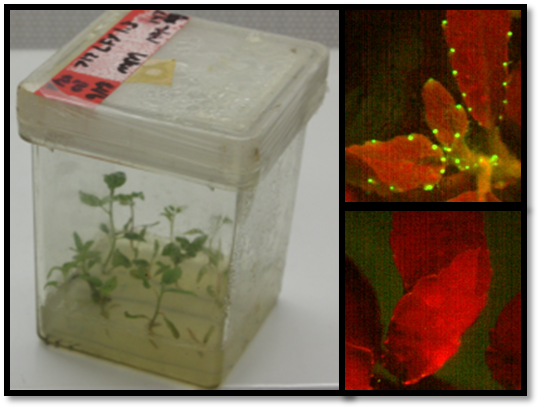 expressing GFP (green fluorescent protein). The plant on the bottom right is the unmodified control. Q: How specific are the nucleases? If you can share, are you seeing off-target edits in your work? We are still at the early analysis stage, so I cannot really say personally how specific they are. But, according to the scientific literature, CRISPR-Cas nucleases appear to be the most active and specific, followed by TALENs, and last ZFNs. CRISPR-Cas nuclease show a lot of promise because of the high activity that they show so far and their off-targeting appears to be somewhat predictable. Q: Are there any GMOs made using site-specific nucleases currently on the market? Do you know of any that are in development? There are no commercially available GMOs currently in the market or in development (that I know of), but everyone in the field believes that the technology is going to revolutionize genetic engineering, especially breeding and gene therapy. Q: Like me, you were raised in Venezuela (I was raised in Barquisimeto and I left after graduating from high school). Venezuela has a moratorium on growing any GMOs and activists would argue that the moratorium is in place because of how harmful GMOs can be. So, how do we know that you aren’t a spy sent to the United States to bring down the imperialist empire through evil GMOs? Ha ha! If the Venezuelan government was making me get a PhD just to spy on the USA, I think I would have quit my job as a spy and gone to Colombia or Costa Rica. I cannot imagine doing research while spying. As it stands, I barely have any free time. And also, I cannot imagine pretending to be a researcher. [Biochica's note: that's exactly what a person tasked with destroying the imperialist empire with GMOs would do: deny it]. Q: What traits are you working on in the lab? Why are they important? I work with flowering genes in both poplar and eucalypts. Understanding floral development and identity genes is important because it will allow us to generate transgenic trees that don’t have functional pollen or ovules, so there is no possibility of transgene flow. Developing transgene containment technologies for forest trees to facilitate the commercial and scientific use of transgenic trees is one of the main goals of our lab. Q: Can you explain what you mean by “transgene flow”? [Biochica note: some activists refer to this as “GMO contamination”] Does it basically mean that you’re blocking the GM tree or plant from hybridizing or crossing with a non-GM tree or plant? “Transgene flow” is the movement of the gene we inserted into our trees into a wild or cultivated population of the same or a related species. And yes, it basically means not allowing our GM tree to cross or hybridise with wild or cultivated trees. Q: If you’re creating a GMO to address one of the major concerns against GMOs, aren’t you creating a circular argument? How would that conversation even go? I imagine it would be like, “Activists! You’re worried about GMO genes getting into the environment? Here’s a GMO that will prevent GM genes from getting into the environment. Go forth and plant it!” Aren’t a few heads going to explode? Is THAT the real plan of the Venezuelan government? To bring down the imperialist empire through circular arguments? Q: Are there any non-GM crops where gene-flow is a problem that may benefit from the adoption of the technology? The other case that comes to my mind is the case of gene purity in seed crops. Seed producers follow standards and practices that guarantee the purity of the seeds available to farmers and home growers. Genetic purity in their case is essential to ensure that the seed will perform as expected, so seed producers must be careful about the pollen that fertilizes their plants. Q: What trait would you like to work on in the future? I would like to work with either nutrients (e.g. create a highly nutritious fruit or vegetable crop), drugs (e.g. create plants that can make medicines), or abiotic resistance (e.g. create plants that can take up heavy metals). Q: There are many articles in the news and in journals about potential traits that may benefit us, many of which never make it past research, but none-the-less create much buzz. Which one(s) do you think are the most exciting? Which one(s) do you think are the most promising? Being a transplant in Oregon and feeling like a true Oregonian since I moved to the Northwest, protecting the environment is a topic dear to my heart. In the University of Washington, Prof. Sharon Doty worked with transgenic poplars that were able to remove more than 90% of contaminants from Superfund sites. According to the EPA, “A Superfund site is an uncontrolled or abandoned place where hazardous waste is located, possibly affecting local ecosystems or people”. I think using trees to clean our aquifers and our soils is a win-win. We get more oxygen, cleaner air, and also cleaner soils and rivers. But, the trees are nowhere near being ready for use outside of university labs. There is also a transgenic pig called “the Enviropig” from the University of Guelph in Canada, that digests phosphorus from its food more efficiently than non-transgenic pigs, so it needs less feed and its waste is less toxic to the environment. Doesn’t that sound like a win-win too?! I am also a big fan of producing medicines in plants (like I mentioned above). This practice is known as biopharming. I am also a fan of using GM mosquitoes to eliminate vector-borne diseases like dengue (after the GM mosquito mates with a non-GM mosquito the transgene causes the mosquito larvae to die). These two cases I mentioned though are closer to production than the Enviropig or phytoremediating trees. Biopharming had a rough time recently because many of the companies involved went bankrupt, but there is an experimental antibody for Ebola currently being made in tobacco by Kentucky BioProcessing called ZMapp that should give this industry a boost, and the British company Oxitec plans to release GM mosquitoes in the Florida keys to reduce dengue and chikungunya (both diseases you don’t want to get, and less yet while on vacation). ZMapp is considered the most promising candidate to combat Ebola and it is currently being used in a controlled human trial in Liberia. The mosquitoes were already tested in Brazil and Panama with great success, so both countries plan on releasing a lot more of them. Q: How much money is Monsanto paying you to develop these transgene containment technologies that will solve one of their public image problems? After all, we all know that Monsanto controls university research. Monsanto has never paid me or our lab for the research we do. Sadly, when many people think “GM technology” they think “Monsanto”. But, in reality the technology is being used by hundreds of university labs, research facilities, and biotech companies developing more than herbicide- or insect-resistant crops. Monsanto and all the other large biotech multinationals like Dupont, Pioneer, or Syngenta come up with cutting-edge seed and agro-chemical technologies, but given that there is no direct benefit to the end user (all the benefits go to the farmer), the public shows little to no support because of lack of understanding and fear. If you look over the ISAAA’s (International Service for the Acquisition of Agri-biotech Application) Pocket K. Documented Benefits of GM Crops, you will find that from 1996 to 2012, global farmers’ income increased by $116.6 million billion and there was a reduction in herbicide and pesticide use of 503 million kgs (ISAAA is an international non-profit “that shares the benefits of crop biotechnology to various stakeholders, particularly resource-poor farmers in developing countries, through knowledge sharing initiatives and the transfer and delivery of proprietary biotechnology applications”). All these agricultural biotech companies perform cutting edge science and create impressive biotech products. However, as companies they are concerned with profits, so given the high cost of generating a GM product, they focus on products that will bring them a return on their investment. Q: My dreams for crop modification aren’t as lofty: I just want a peelable pomegranate. Do you think that the research you’re conducting might be able to help? My work won’t directly affect the possibility of creating a more peelable pomegranate. But, indirectly it can bring science closer to your dream. My research can add onto the increasing scientific knowledge base that is proving that site-specific nucleases can someday be an important tool in crop breeding. If we find the gene or sets of genes involved in making the pomegranate’s skin, we can either modify or replace the genes for ones that will make the pomegranate easier to peel. For many centuries, humans have been modifying the aspect, size, and taste of cultivated crops by doing selective breeding without knowing anything about genetics. Wild bananas and corn (and dogs...chihuahuas come from wolves!) are great examples of what selective breeding can do. Wild bananas are small and loaded with seeds. Meanwhile, cultivated bananas are large and have tiny seeds (that actually are not viable because cultivated bananas are sterile). Teosinte (the wild ancestor of corn) make small ears with only two rows of hard fruit cases that protect the seeds. Corn makes large ears with eight to twelve rows of tender seeds (no hard fruit cases). So, GE is basically streamlining breeding by allowing use scientists and plant breeders to perform highly selective and direct breeding using genes from the same species or other species. [Biochica’s note to the spouse: it sounds like there’s the remote possibility that Estefania’s research might be able to make my pomegranate. Please be advised that we may have to move to Oregon in the near future to help conduct this research]. Two recent surveys have had the wheels in my brain churning. The first is a survey finding that 80% of Americans want food containing DNA to be labeled. The second is a survey from the American Association for the Advancement of Science, where scientists and non-scientists were surveyed on a variety of topics, and 88% of scientists said that GMOs were safe compared to 37% of non-scientists surveyed. It was the single question with the broadest gap in results. I've been thinking a lot about these and I've shared my thoughts on the importance of education to address the knowledge gap in a previous post. But I was stumped in trying to understand exactly what it is that concerns people about GMOs. Sure, I've seen all the crazy memes about GMOs and cancer, but there's got to be some deep fundamental fear or concern that leads people to believe these memes in the first place. In an attempt to better understand concerns and to share what I've learned, I reached out to the local high school where I live, provided my credentials, and told the head of the science department that I'd be happy to chat with students about biotech crops. Two teachers took me up on the offer and over the last month, I had the opportunity to chat with students from freshman and senior classes about biotech crops. I also chatted with them about my career in human genetics and encouraged them to consider careers in STEM. It was fantastic and I learned a lot. In talking with them, one point really stood out in terms of concerns/fears about GMOs: the word "natural". Some of the freshmen stated that they didn't like the concept behind GMOs because it wasn't "natural". This stood in stark contrast with the discussions I had with the seniors, where the word "natural" was never mentioned. Furthermore, as the seniors debated the topic, we were forced to create an arbitrary definition for the term GMO to focus our discussion because multiple times the students brought up the fact that "everything is modified" or "what's the difference between a GMO and a seedless watermelon if they're both made in the lab". The seniors had tons of questions about pesticides, biofortified crops, and labeling, but I think that the freshmen left terrified about our conversations on mutagenesis. One of them stated "it just doesn't seem right. It's so unnatural". Natural. If you think about it, it's entirely subjective. What's natural to you might not be to me. My mom is an orchid lover and she had dozens of orchids growing on hanging coconut mats in our courtyard in Venezuela. She'd probably say that the orchid I have growing in the pot on my counter isn't natural. Someone else could have pointed to her flower collection and stated that it wasn't natural compared to the orchids growing on trees in the wild. Who's to say that these perspectives aren't right/wrong? I think that each one of us has a subjective notion of what's "natural" in our minds, and if it doesn't fit within that framework then we tend to reject it. Vaccines are a great example: it seems "unnatural" to have a needle go into your arm and to inject a substance. I actually heard an individual on a radio talk show describe how she wasn't going to get the flu shot for this very reason. It turns out that rejecting what's unnatural is actually a "thing" used in arguments and is known as "appeal to nature", whereby one states that what is natural is better. In a previous post, I explained how most of the "toxins" and pesticides we ingest are naturally occurring substances found in our food, some of which are known carcinogens (see! I used the word "natural"!!). Yet we're MUCH more concerned about synthetic pesticides and other "artificial" substances found in our food. I think the same is true about GMOs: we deem these to be unnatural and therefore "worse". They were made in a lab and are therefore artificial and not "as good". This "appeal to nature" is what drives the use of the term "natural" plastered over hundreds of food items, and there's even debates to determine what can/should be deemed natural for a food label. When something says "all-natural ingredients", what does that even mean? After all, it was processed in a factory since it's in a container, so doesn't that make it "unnatural"? As person who had gestational diabetes during her pregnancy and was able to control it through diet and exercise, let me tell you that our bodies can't tell the difference between a bite of candy that has X grams of sugar and an orange that has X grams of "natural sugar" (of course, the orange has more vitamins/nutrients, but I'm focusing exclusively on the sugar content for this analogy). So when I see items that say "made from natural cane sugar", I get pretty irritated because somehow that label is trying to convey that it's healthier or better than ingredients made from what must be "unnatural" sugars. The spouse is watching Downton Abbey on the laptop next to me, and I'm reminded of the episode where they brought in a phonograph. It created such a kerfuffle because it was against tradition and not the way things had always been done. It's similar to our discussion here about what's "natural". What surprised me in chatting with the students was the immense difference that just a few extra years of high school biology made, and it honestly gave be a bit of hope that with scientific education and communication, we might be able to make a difference in the discourse surrounding biotech crops. Also, if there any topics/papers that you want me to review, please send me a note. And if you haven't subscribed to this blog, please add your email to the subscription list. You won't get spammed :) I don't post frequently enough for that!